Scott and I shared how much Jason and Michelle have impacted our lives. I can truly say that I never grew in my Christian walk until I joined my current church and this class. The people in our church and class are such genuine Christians. Some of the most Godly people I have ever met. Jason has challenged me SO much in my faith. Two things that I will never forget is that 3 years ago Scott began to question his salvation and Jason came over late at night to pray with him and helped Scott accept Christ. He has been such a HUGE mentor to Scott. It has changed him so much and has completely changed our marriage. Also the day after Harper was born when Scott was in Tulsa and I was still trying to get out of the hospital - that was the hardest day of our lives. We were being told she would likely not live and we were separated. And Jason and Michelle drove to Tulsa and spent the entire day with Scott. He needed a Godly friend that day and they filled that need. They will never know how much that meant. We are both better for knowing them and will miss them dearly. Do you have a Christian mentor other than someone than your family? My parents have obviously been the biggest influences on my life but I would love to hear who in your life has challenged you and helped you to grow spiritually. If you don't have someone like that in your life - I pray God helps you to find someone. I think we all need mentors to help us to grow. It makes me want to break out into a chorus of "Thank you for Giving to the Lord......I am a life that was changed..................."
Ok I havent read this post yet, I will as soon as I comment! I just went back to go through your whole blog. Well no I didnt "just" go back, I went back a coupld of hours ago!! I found two posts of pictures you posted of yourself as a child, and I think it looks as if it's Harper!! Here are the links to those two post! I thought they were so cute!! I think you were such a beautiful child and you are a beautiful woman and I totally see Harper in those pictures!! I'm glad you had a nice goodbye for you Sunday school teachers. We have a nice class at our church, young marries/young families. I can believe how many families you have had sponsor a child. 106! that is amazing! We have small groups in our church (we call them life groups), and my life group leader has been so influencial in my walk/growth in the Lord. Also, I sing on the praise team, and the worship pastor is another person who has encourged my growth. I am so thankful for their willingness to speak into my life...I pray I am open to the Lord to be used in such a way in another's life. Charlotte is such a great place. My cousins and aunt & uncles live there and a few friends have moved there as well!! We def. need a spiritual mentor in our lives. Id love to chat with you one day about that :) Amanda and I soooo wish you lived here! HA! What an awesome story Kelly! I'm so glad that you all are involved in such a great group with the church! Just wanted to say I have that same dress! Target, right? I got it on sale for $6.44 ...so of course I had to buy two different colors haha! Besides my parents, my youth minister and a former pastor have probably been my biggest mentors/influences. They have both been there when I needed someone to talk to/with and have helped me in my Christian walk and just helped me as an overall person. My mother was of course my best mentor. She died last year but left a beautiful piece of her in my heart. When we finally made the decision to turn off the machines and let her go to God, a lady from my church called to make sure everything was OK. She was in the middle of a youth conference and felt the need to call me. Her husband is an elder at our church & she has been such a wonderful mentor to me in the last year. I feel as if God lead her to call me that day and appreciate her being there for me since Mother died. I would have to say you are doing a great job of being a Christian Mentor for me and I'm sure so many other blog readers out there. You have a way of saying things that make me want to be a better person (not that I'm a bad person HA!). You and Scott were so blessed by this couple, now they are going to bless others. They were the angels in your lives when you needed them the most. My mentor is my friend molly who I met through young life about 5 years ago. I know I can always count on her when I need advice or prayer. I am so thankful to have her!! Although I have never met you, you are the person who got me to start my relationship with God again. Because of you, I've turned to Christ and have made him a part of my life, I don't think I could ever thank you enough. I've had a few mentors in my life...my friends Leah and Sarah in particular. My friend Karl as well. It's great to have spiritual friends!!! We just joined a new (to us)church in Springdale and I can honestly say that I have never been more excited and enthusiastic about a church family as I am about this one. The pastor, especially, is so enthusiastic and easy to listen/talk/relate to. I wish everyone could find a church where they feel like they truly belong. I have to say after my me-maw you are doing a great job of being a christian mentor to me from the blogger world! You have really opened my eyes to so many things! Compassion is a big one! I thank you so much for that! Charlotte is a great place. I've been living here since I was born and couldn't imagine living anywhere else. Good luck to your friends in their move. Glad you guys are back safe and sound from your trip! I know you were missing that sweet girl! And so sorry to hear such wonderful friends are moving away, hopefully you'll be able to stay in touch! Well Charlotte is THE place to live, obviously!! Come visit! ha! My friends Bonita and Debra have been sweet mentors in my life over the last year. I am blessed to have them! I LOVE the color BROWN on you. You look beautiful in this picture. And what a GREAT testimony for these two people to have such a great impact on your life! That is a beautiful post Kelly. I know how exciting it is to see your husband come to Christ. I prayed for my husband for 15 years, and then a wonderful associate pastor/evangelist from our church lead him to Jesus! That was 15 years ago. We have been so happy together all 33 years of our marriage, but especially these last 15 years. I thank God for Pastor Norm and his faithfulness to share the Lord. And our senior Pastor also, who has been wonderful too. He has always been there for our family,...especially when our daughter Lynnette lost her second son who was born without a brain. (anenchephaly) And the next baby boy that died too. He also did the service when her 6 yr. old Anna died 5 years ago. So many of our church family rallied round us when we needed them the most. I thank God for all the love he gave us through His people. They all reached out with loving arms, much like these friends did to your Scott. Hey, I am thankful that you got home safely from your mission trip. I know you were so glad to see Harper! I loved keeping up with her through Grandma Judy's posts. In the 5 years leading up to my marriage, I had several lovely ladies that Titus 2-ed me. They still do, and I'm so richly blessed to be under their loving care and teaching! What a beautiful post about beautiful people. I do not have Christian mentor, other than my family, in my life. I can only hope that I am blessed with someone like Jason and Michelle. I am a NC girl too and I miss it terribly. I know they will love it and be welcomed with smiling faces. My most precious mentors are our daughters, Jenny, Leslie and Stacey ~ very strong young Christian women. Outside of our family members would be Lynne Griffies, Kay Mayfield, and Deborah Aldridge ~ beautiful friends that walk the walk and help me to be a better person for Him. that is awesome that you have had these special mentors in your life. mentors are such a blessing! Kelly, I can honestly say that YOU might be that special person in my life! Thank you! My big influence has also been my Sunday School teacher's wife! I was going through a rough time and God just put her in my path (literally, in the church foyer). She's been an awesome mentor for me. When I was 16 we moved back into the US so my brother and I could finish school here. I desperately missed my church in PR. With family far away, the people there were family. Although I did not care for the new church we were going to, my pastor's wife took an interest in me. I would sometimes meet her after school and she would take me visiting with her. She listened to this third culture kid as I shared my struggles in acclimating to life here in the US. She offered Godly advice, prayers, and wisdom based on Scripture. She always set an example of love and Godliness. It was neat to run into her many years later as my son was graduating from college and thank her for being so special to me. We haven't truly been Christians until recently and we still have a long long way to go. We have only been going to our church for 2 years now and will soon be moving to another state, I am struggling with the thought of finding a church home. At the church we go to now I went to my first ever Bible class and one older lady, Elizabeth, was the first one to come introduce herself to me and was a huge help to me in that class. Through out the class those ladies taught me much more than I could have ever learned on my own. Our preacher is super I will probably miss him the most, it just is an absolutely wonderful church. If you are ever in Jefferson, GA, you should stop in to Galilee Christian Church I can't say enough about them. The whole church prayed for Harper. My Aunt recently moved here to Tallahassee and she has always been someone I look up to spiritually. I had been wanting to start a Bible study with some of the "younger women" in my church but I didnt know where to start or who was going to lead and she came to mind and it has been the best thing ever! We started out reading "Calm my anxious heart" and I just love it. I have been going through some fertility issues and that book has really opened my eyes to trusting the Lord and not always trying to handle things myself. It has been the biggest relief off my shoulders. My grandparents are without a doubt the reason I found God. I am do thankful for that! I wish so badly I had a church like yours. Please keep praying that I find a church soon. :) I have a very good and dear friend that is a super Christian and he and I have been friends for about 15 years. he has always inspired me to be a better Christian. I was living a terrible lifestyle and woke up one morning afraid that if I kept going down that path, that I would die. I up and moved out of my apartment, dumped my boyfriend, and left behind everything I knew and loved and moved into a new apartment. I had a roommate named Kelsey and I know that God put her in that situation to be an influence and example for me. I could not have led a successful last few years without her example. Kelsey, thank you and I love you!! I posted when you shared about your other friends moving to Charlotte. I'm a native and wouldn't want to live anywhere else. Come visit all of your friends in Charlotte and have a get together so we can meet you and Harper! When I left home I met many women who challenged me and helped me grow. At a Christian University, and then I taught at a Christian private school in Europe.. I didn't grow up in the church and I REALLY valued these women in my life!! It's so important to surround yourself with people who value what you value.. Only then can you grow and give back to others. North Carolina is a fabulous place! You should visit sometime :) I know you're sad to see your friends go but I have learned, like the song says, "A friend's a friend forever if the Lord's the Lord of them." NC is a great state! Come on over to visit anytime!! It is such an amazing blessing to have Christian mentors! At only 21, I LOVE the mentors God has sent to me--one being a professor of mine! ..I just enjoyed being with her so much and admired her and learned from her and became a part of her family. She helped walk both me and my family through some really big issues and times in our lives --then one day she dropped a bomb..about a past sin in her life, a sin that had been forgiven and resolved but that she was suddenly needing to work through some more and needed to share with me if we were going to have a transparent and Godly relationship..i did not want to hear this. I was really hurt dissapointed and SCARED, i needed her to be PERFECT, and i realize now that i thought subconciously "if she cant do it, how will i ever do it"..very inmature and hard to admit but it totally shook me...by God's grace and gentle hand he used this to teach me i did not need a PERFECT mentor (like i thought i wanted) because i have a PERFECT SAVIOUR and i just need to be around and learn from someone that loves Him and is constantly growing and blooming in that grace and relationship..SOMEONE FORGIVEN..not perfect...and that i needed to stop striving too..oh and that it wasnt always about ME and my needs..that she was a person with struggles too..not a finished work! i begin to pray and think about HER..amazing how great it is to get eyes of ourselves and realize those we think "have it figured out" are just pilgrims too! i am so thankful for this woman..she has taught me so much, even in sharing her weakest moments..in fact, i think in just being real, these people God puts in our lives teach and love us the most when they show us some of their deepest struggles. I can honestly say that your blog and Lynnette Kraft's blog is what challenged me to know the Lord in a deep way. I saw you, who was so proud to be a Christian woman, and so genuine and loving and then Lynnette was full of hope in the Lord after such deep tragedy, and I wanted that. So I prayed to the Lord to show me who He was and it started a journey that led me to finding a church home, my husband and daughter being saved, weekly bible studies, and also created a special bond with Veronica because we are traveling this journey together. We may not have ever met Kelly, but I will always remember you as such a great role model for me and that changed my life! The person who really cemented my foundation and my belief was my friend April. I was going through the roughest time in my life (daughter's accident) and I was at the lowest point ever. She and I went to lunch and I was crying the whole time talking to her about this and she asked me, "Where is your faith?" That was it! That was EXACTLY what I needed to hear. I went home that night and read every scripture on faith and Hebrews 11 is still a chapter I refer back to often. I don't know if she will ever know how much those four words have forever changed my life! As I told you a few weeks ago, you have made a great impact on my spirituality in my marriage. And you were brought to me through Angie Smith, who I honestly believe saved my marriage last year. It was the hardest year I have ever had and her words of ultimate faith and encouragement to just live life and rely solely on God, made all the difference for me. Thank YOU for being such an inspiration! My pastor's wife has been a spiritual mentor to me, as well as our church's prayer coordinator. Those two ladies have corrected, encouraged, prayed for, and advised me for years! It's really great to have such wonderful people in your life. For us, one of them is our pastor. He always calls or visits or whatever we need whenever. :) Thankful to be a part of God's family. "Is this a person I could MARRY? Is this a person a man after GOD'S own heart?" That stayed with me. I dated 3 guys over the course of my young life and I married the third. I will NEVER regret not "sowing" my wild oats. I think it is a pretty cool thing that I have been with my husband for almost ten years and I am less than 30 years old. I will never forget Joe and Vanessa and their many years of influence and advice. I truly believe that they were a part of making me WHO I am today. That's one of my favorite songs of all time. When I was a senior graduating from high school, we sang it to my church congregation. I have been incredibly blessed to have mentor that has guided me since 6th grade. Now that I'm days away from 25, that amounts to 14 years of being poured into, loved on and prayed over. I'm forever thankful to Ms. Teresa...and it has been her love for me that has inspired me to do the same. I'm now mentoring 4 6th grade girls and am getting to see the reverse side of the mentor process. What a blessing! I love that the Lord puts people in our lives to teach us and be a positive influence. I had a mentor, but she sadly moved away. I was heartbroken. I have many godly women in my life, but no one pinpointed as my specific mentor. I have been thinking about this a lot lately. I am waiting to see who the Lord lays on my heart. I am blessed like you are with a WONDERFUL set of sunday school teachers and a WONDERFUL class. There is NOTHING more encourageing than knowing you have people in your life that will pray for you and love on you when you need it most. We all have kids around the same age, and know what each other are going through on a daily basis... Not to mention that all most all of us are HUGE BAMA fans... That's been our favorite past time to watch games together. God has blessed me more than I could ever imagine when he gave me this wonderful church family for whom I am SOOOO thankful! The blogs from you trip were so encouraging and REALLY touched my heart. It's allowed me to open my eyes and see that there is a lost and dying world that ONLY God can bring joy and peace to! I WILL sponsor a family... I'm thinking of the CSP program, because I have a huge burden for new mothers. That is a wonderful ministry... I thank God for wonderful people that he uses for HIS GLORY! Glad you made it home safely to your baby girl! I hope she's not to rotten from all that attention she got from her sweet grandparents! Have a great week! and GET SOME REST!!! God Bless You Kelly, as you are SUCH a blessing to me daily! Oh Kelly, this is such a wonderful post!! I love that you found such great mentors & love your church family. I have to say that our church family is wonderful (we have only been going there for 3 years) and have been such an inspiration. Great mentors in my life besides my Mom are: Laine, Naomi, & Robyn just recently--I am VERY blessed to know these ladies. From blogging I get inspired from YOU, MckMama, & Linny. THANK YOU!!! NC is THE place to be! ive lived many places and i loooove being a carolina girl. there isnt much i dont about love my state. I know this wasn't for this post, but I just wanted to let you know that I am now sponsoring a beautiful 5-year-old girl from Ecuador named Adelaida through Compassion. Thank you so much for telling your readers about this amazing program and for letting God use you to open my eyes to ways I can help. I can't begin to express to you the joy and peace that I am feeling right now. I am in a season right now where I have been blessed with several older women/couples in my life (almost to the point of "uh...where are my PEERS?!"). I'm in a neighborhood Bible study with 3 other women — and we represent 3 different decades! (I'm the youngest by about 10 years). While I'm spiritually one of the "oldest" in the group, it's wonderful to have these friends who have walked before me as mothers and wives. I've benefited from their wisdom & advice. My husband and I are also a part of a church small group with 5 other couples that are all roughly 10-15 yrs older than us. We have been a part of this group for almost 2 solid years now (which is a record for me! ), and these friends have walked with us through some real sorrows and joys (a miscarriage, the subsequent pregnancy with our daughter, my grandma's death, etc.). They, too, have offered us so much practical advice, encouragement, prayer and friendship. Finally, my brother & sister in law. I've never had older siblings, so I'm so thankful I gained some thru my marriage! They are awesome people of God who have challenged us and love us and are true friends. Charlotte, NC is the greatest place to live. That's where I have lived my whole life. Come visit anytime the door is always open! North Carolina is an amazing state!!! I have lived here all my life. Your friends should love Charlotte too! You all will just have to come and visit. Have a great week!! Love & blessings from NC! They sound like really special people!! What a blessing they have been in your lives. I'm in Charlotte, too & have to agree it is a great place to live. There are many great churches here, but if they need a recommendation, please let me know! For my spiritual mentors, other than my mom, I would have to say our SS teachers when we lived in Chicago for 8 years & attended Moody Church. We had the most godly couple teaching us & had such a wonderful small group Bible study that became our family! They were so hard to leave when we moved back "home" to NC. But God is SO good...He immediately blessed us here with another group of godly friends to strengthen, encourage, & hold us accountable to living in obedience to Christ! It's so funny that you posted this tonight because I just finished typing up my personal testimony for my husband's deacon candidacy at church...so I had just been thinking about the people who had influenced our lives the most for Christ. I will be praying that the Lord clearly leads Jason & Michelle as they find their new church home here in Charlotte...oh, do they need a house? We are selling ours! LOL! PS: I have to agree, you need to come to NC & visit! I've had several ladies in my life that were great to encourage me in my walk. I didn't truly understand what a life of surrender to Christ meant until I was in college. God put me with amazing ladies to room with and led me to a church that taught the Word of God for the first time in my life. There several more ladies help me see how to follow Christ with every aspect of my life. I PTL for Page, Lynnea, Gloria, and ReRe, just to name a few. I love how God has used older women in my life as well as ladies that are in my same life stage. Such a blessing! Charlotte is SO nice- I live about an hour north of Charlotte, and go there often- I hate you're losing close friends; but we'll take GOOD care of them here in NC! I have loved reading about your El Salvador trip!! Glad you're home safely!! I don't know what's up with NC..we have had 2 friends move there in the last few years and I have family there as well. How blessed you are to have such amazing mentors. When Rick and I were dating I worked with a very special Christian man and we became fast friends with he and his wife...that was 25 years ago. 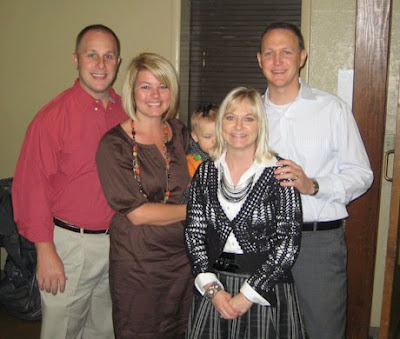 They were instrumental in helping us get back on track with the Lord and our lives. Thank you for sharing. I have had 1 person in the last year to help me grow spiritually in my christian walk. She has quite the testimony of her own. I live in Charlotte and really, really love it here (I'm Todd & Courtney's cousin). Your friends will be met with open arms! My original spiritual mentor was a really dynamic youth minister, Keith. He was amazing and was really helped lead me and so many others to the lord. He has since moved on to a huge church in Kentucky. These days I am very inspired by YOU actually. One spiritual mentor, other than my oldest sister, is my closest friend. She can help me spiritually when I'm feeling down. As my husband and I are advisors for a religious university club, we lean on each other for alot of spiritual guidance and our focus is teaching the Word to these college kids that are lost and some that are just learning about the Word. Your blog is truly an inspiration Kelly! Charlotte is a wonderful city. We live about an hour from there and want to move there! Sounds like you have a lot of requests to come visit NC!!!! You are have def. been my mentor for the last year!!! OMGoodness! I could sing that entire song!! LOL Ahh... the life of a pastor's daughter, right?? I have 2 very special people in my life who have been such amazing mentors to me in my spiritual journey! In high school I really began to question things that were going on in my life and they took me under their wing and prayed with me and for me and invited me to church with them. They are husband and wife and he was my high school volleyball coach and I ended up helping in her classroom as a volunteer my junior and senior year of high school. They served as my sponsors when I joined the church and they have not given me the amazing opportunity to serve as their daughter's God mother which I am so honored to do. I am so excited to share my love for God that they helped to instill in me with Kate! They sound like amazing people. Sorry you're losing them! I wish I did have people like that in my life!